This concert is being hosted by Southern Gospel Ministries, a local non-denominational, non-profit committee who have been bringing high-quality southern gospel music to Redmond twice a year since 2011. The committee appreciates the hospitality of Highland Baptist Church who has provided the venue for our concert this spring. 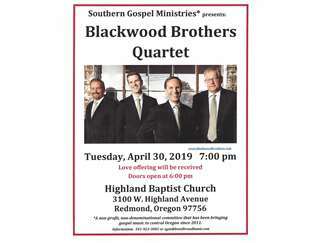 Internationally known Blackwood Brothers Quartet formed in 1934 in Choctaw County, Mississippi with four brothers as the original members. In June 1954 they won the “Arthur Godfrey Talent Show”. Later that summer, two of the brothers died in a plane crash. By 1956, James and Cecil Blackwood, as well as J. D. Sumner, organized the first National Quartet Convention which still exists today and is held in Pigeon Forge, Tennessee. The Blackwood Brothers have recorded over 200 albums and toured in 47 countries. They have won eight Grammy Awards and six Dove Awards. They were inducted in the “Gospel Music Hall of Fame” in Nashville, Tennessee in 1998. A love offering will be received. They will have a selection of their music available at the concert. Cost: Love offering is received.